Elina Kalendarova, a native of Tashkent (USSR), joined The Philadelphia Orchestra in 2002. She began her violin training with Nathan Mendelson. Later she earned a master’s degree from the Moscow Conservatory where she was a pupil of Igor Bezrodny. 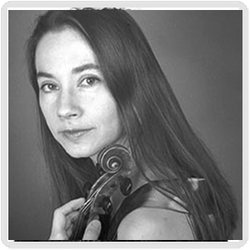 While doing her post-graduate work, Ms. Kalendarova served as a concertmistress of the Ars Viva Chamber Orchestra. She recorded a CD of chamber music by Taneyev and Glinka for the Le Chant du Monde label. Before joining The Philadelphia Orchestra, Ms. Kalendarova played with the American Symphony Orchestra, the New Jersey Symphony, and the Pittsburgh Symphony.